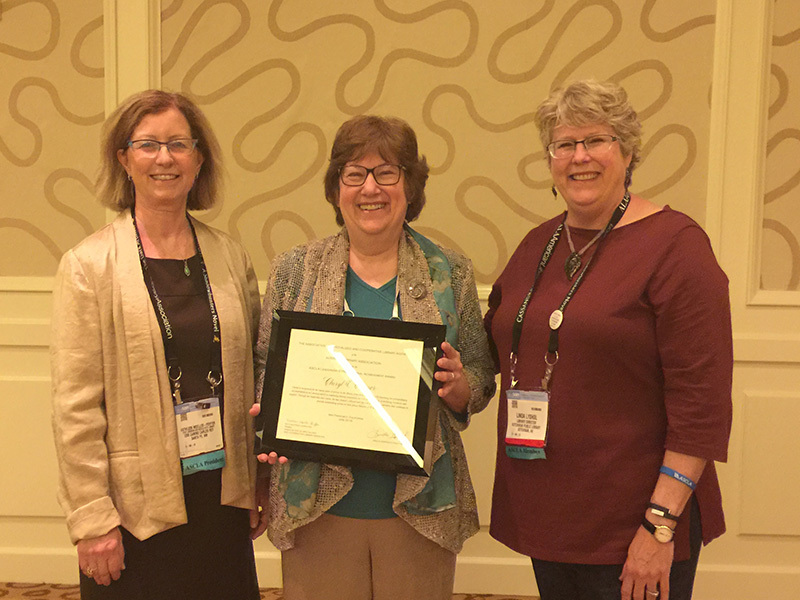 At the American Library Association’s Annual Conference in San Francisco last month, Executive Director Cheryl O’Connor received a citation for the Leadership and Professional Achievement Award from The Association of Specialized and Cooperative Library Agencies (ASCLA). 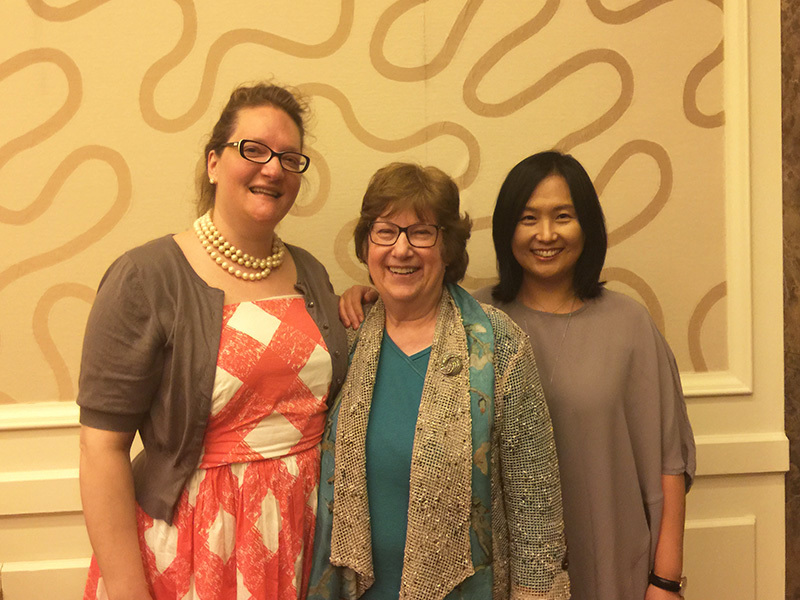 Cheryl, who was nominated for the award by New Jersey State Librarian Mary Chute and former Deputy State Librarian Kathi Peiffer for her hard work joining four vibrant, but independent regional cooperatives into one state-wide cooperative. New Jersey was very well-represented at the ASCLA Awards Reception, as you can see by the photos below. Congratulations, Cheryl! Adam Szczepaniak, Deputy State Librarian and Director of the NJ State Library Talking Book & Braille Center, received the 2015 Francis Joseph Campbell Award, also from ASCLA. He was selected for his outstanding contribution to the advancement of library services for blind and physically handicapped people. His creation of the The Outspoken Library has benefited over 30 public libraries serving communities throughout New Jersey. 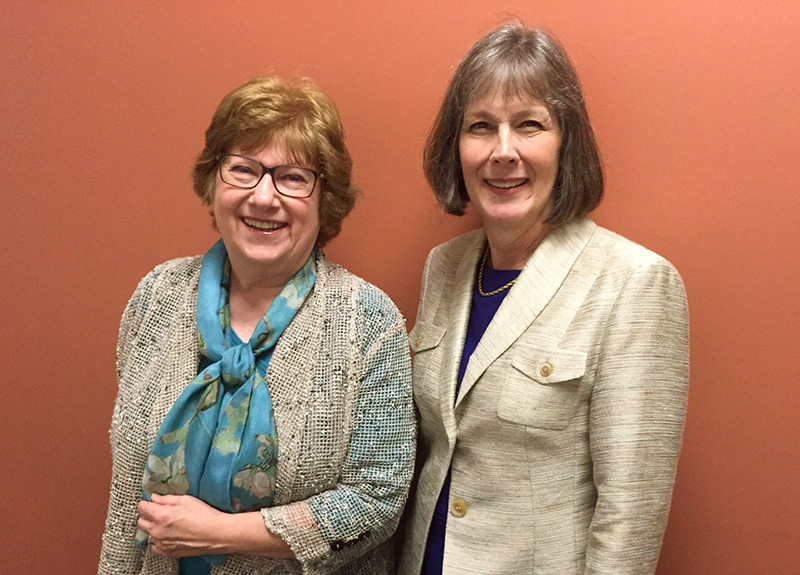 Deputy State Librarian Peggy Cadigan has replaced the retired Victoria Rosch as the New Jersey State Library liaison to the Executive Board. We echo Candice’s warm thanks to former Board President Jane Crocker and offer her a big cheer for having led the Board with enthusiasm, skill and good humor through FY14 and FY15. The LibraryLinkNJ Executive Board is pleased to announce that it has hired Bradbury Associates/Gossage, Sager Associates to assist in the search process for replacing the retiring LLNJ Executive Director, Cheryl O’Connor. The nationally recognized search firm specializes in executive searches for libraries. ‪The search process will begin this month and continue into the fall. The goal is to make an appointment by the end of November, with the new Executive Director starting by January 2016. The position will be advertised locally and nationally, and will be an open, competitive search. Cheryl's last day in the office will be Wednesday, September 30th. James Monroe Elementary School, in Edison, NJ, was destroyed by fire in March, 2014. School Librarian Vera Beal applied for and won the American Association of School Librarians and Dollar General Literacy Foundation’s Beyond Words Disaster Relief Grant, which will furnish $50,000 for the re-establishment of the school’s library media program. In September, the school, its students, faculty and staff, will have been relocated for a second time, to a former parochial school, which will be James Monroe Elementary’s home until the completion of a new building on the school’s original site. School Principal Lynda Zapoticzny traveled to San Francisco to receive the grant citation in person at ALA’s Annual Meeting last month. Congratulations to the James Monroe Elementary community on this major step forward to rebuilding their school library program, and best wishes for the school community as a whole. We have a renewed discount on Britannica products, available to all LibraryLinkNJ members through July 31, 2016. Britannica’s range of digital products go well beyond the standard Encyclopedia, so take a look at the offer. Discount levels average 25%. For all the details, review the main On-Site, On-Demand page on our website. If you missed the July date, please make sure to secure your spot for October 20! This four-webinar series is an in-depth course training for you to manage content and administer the Sample Drupal Library Website that LibraryLinkNJ created for our member libraries. LibraryLinkNJ member libraries are eligible to download this sample site at no cost, and can modify/customize the sample site for their own library at their own pace. LibraryLinkNJ has made some improvements on the sample site. Please find more information about our Drupal Sample Website for Libraries. For more details, go to the program page on our website. Space is limited to 20 participants for the series. Register early to secure your spot! More information including the event schedule, programs, registration information, carpooling form, etc. will be posted at the event page soon. We’ll open registration at 9 AM on Monday, August 3.